SGX does not provide point values in their price feed. For further details on configuring these values, refer to the following section called pMerge. The SGX_OTC Gateway installs with the pMerge.exe executable. During installation, this executable runs automatically to set up and configure the product tables that the TT Gateway uses. 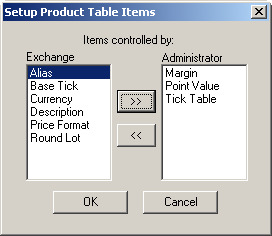 Additionally, when you upgrade a SGX_OTC Gateway, pmerge.exe runs automatically to merge pre-existing product tables with any new product tables distributed with the latest TT Gateway software.The only time you must use pMerge manually is if TT distributes updated product information in a customer advisory. TT distributes this product information in a file named SGX_OTC.pmg. In Windows Explorer, navigate to <root drive>:ttbin. The Open Guardian product table merge file dialog box appears. Navigate to the location of the SGX_OTC.pmg file. pMerge creates the new product table. After pMerge completes its tasks, the pMerge status bar displays Finished. pmerge: Runs the pMerge.exe file. If you do not include additional commands, this command opens the GUI. Refer to the procedure called To run pMerge from the GUI. -e Exchange-Flavor: Sets the Exchange-Flavor of the TT Gateway whose product table pMerge updates. -q: Sets pMerge to run in quiet mode. pMerge does not output informative text in the Command Window when it runs. -v: Sets pMerge to run in verbose mode. pMerge outputs informative text in the Command Window when it runs. During a default SGX_OTC Gateway install, the Alias, Base Tick, Currency, Description, Price Format, and Round Lot should be owned by the Exchange and Margin, Tick Table, and Point Value should be owned by the Administrator.